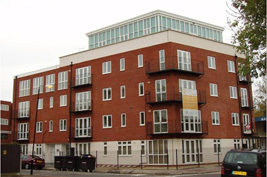 William Martin undertook the Project Monitoring role for this new affordable housing development of 14 shared ownership units developed by Circle Anglia Housing Association in Freemasons Road, Custom House, in the Royal Docks. With a typical market value of £210,000 purchasers were able to buy a minimum 25% equity stake on a part rent/part buy arrangement under the ‘New Build Homebuy’ scheme, with the option of ‘staircasing’ this stake at a later date. This car free development was finished to a high standard with fitted kitchen incorporating cooker and fridge freezer, ceramic tile floors to the kitchen and bathroom and fitted carpets throughout the remainder. There is a lift to all five floors, including the two penthouse flats.